After hours of searching for the very best sandwich toaster and analysing hundreds of customer reports, we finally feel like we have found 3 great products that have been tried and tested by real people. 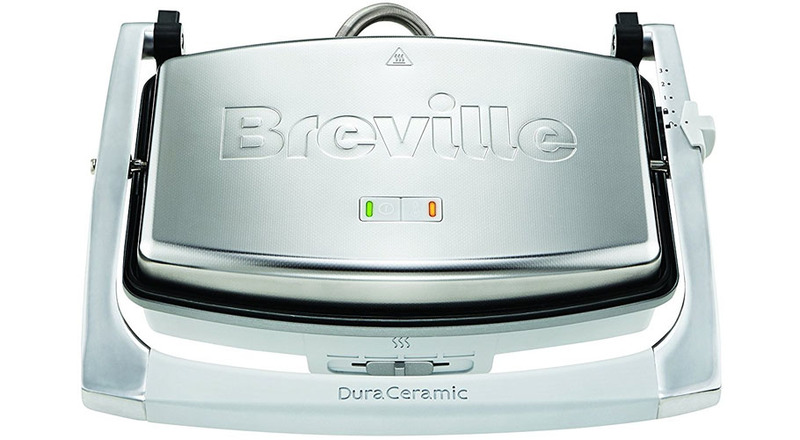 We believe that the Breville VST071 Dura Ceramic Sandwich Press is the best toastie maker for most people. 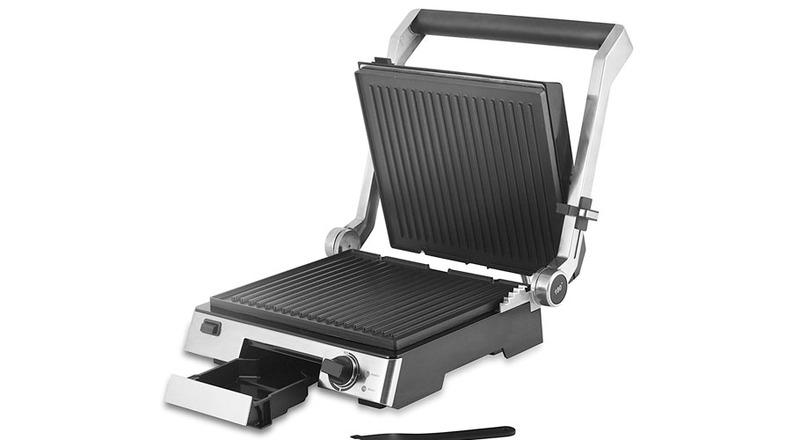 If you really love toasties and getting a 2 in 1 bargain then why not consider splashing out and getting the Tower T27012 Family Health Grill. It allows you to get great toasties and doubles up as a healthy grilling option. And if you are on a tight budget but can’t be without a sandwich toaster then the stylish Breville VST025 Sandwich Press could be for you. What is a Sandwich Toaster? Also called a toastie maker, sandwich toasters are a healthy and fun appliance you can use to make a range of foods. They are usually hinged metal plates attached to long handles and are used to heat/ toast/ seal sandwiches with filling. 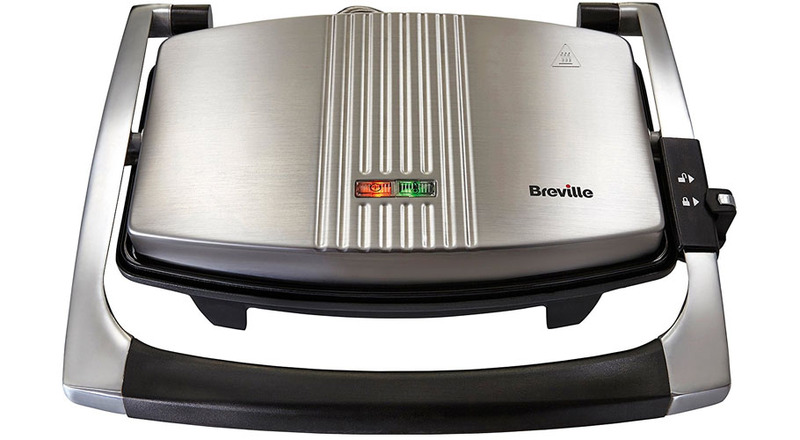 Originally commercial sandwich toasters were made by Breville and as a result, are a popular choice when purchasing a domestic appliance. However, the original model was restricted to just toasties, making them a specialist item which were rarely used. With the new flat or grill plate design, the sandwich toaster has become much more versatile and can be used far more regularly as a healthy alternative to traditional grilling. This is because the fat and grease drain off the plates, meaning you can enjoy a healthy, juicy steak. Toastie makers are generally simple by design but it is important to consider some key aspects when buying. This is a popular impulse buy item and some users tend to purchase without considering which is the best model for their needs. Whenever making a purchase it is important to consider how you can make the most of your money. Most decent sandwich toasters range in power from 1000 watt to 2000 watt, but not all have a temperature gauge that allows you to adjust the power output. For heavy usage, we would advise you to purchase a high watt toaster with adjustable temperatures. The higher watt machines tend to cook food more evenly and quickly, but this could also lead to food burning if you don’t keep an eye on it. If you are just looking for a budget toaster that does not have a temperature gauge, then the lower wattage could be more beneficial. This is an important consideration for families, as a small sandwich toaster will not be able to accommodate for many people. But if you live alone or with a partner, a smaller appliance could be beneficial as it won’t take up as much space. How often you use it– if you’re going to be using it a lot, then regardless of family size it may be more beneficial to buy a bigger machine. Where you’ll put it – will it be a constant counter top dweller, or will it be stored out of sight when not in use? The size of your toaster will affect how much countertop or storage space it will use. What it will be used for – If you are planning on using the sandwich toaster as a grill as well, you might need to think about how much space you’d need to fit stake on the plates. Most sandwich toasters are minimalistic by design, but it’s important to think about which features could be beneficial. Removable plates for washing – Not all sandwich toasters have removable plates but this makes cleaning much easier. Completely extendable grill so both sides can be used – This can allow your toaster to have a dual purpose, and increase the amount of food cooked at one time. Temperature control – Being able to change the temperature of your sandwich toaster is really useful and helps to prevent your food from burning. It also allows you to cook foods at various intensities. Cool touch handles – This is feature ensures safe handling of the sandwich toaster but can be difficult to achieve. Many users have complained of the handle heating up. Because of this, it’s important to look for rubber handles or handles that are designed to avoid the heat from the plates. Non-slip legs – This is an essential feature of any sandwich toaster because it ensures that the toaster does not slide on the kitchen counter when the lid is being pressed down. Ribbed plates – Many people prefer ribbed plates as it gives the authentic grilled look to your finished toasty. But it also helps to prevent your food from sticking to the bottom of the plates. Grease collection tray – Most sandwich toasters have a removable tray either at the back or underneath, this is a useful feature for cleaning your toaster afterward. But it is important to consider the size of the tray and the speed at which it will fill up when high-fat food is cooked. If this appliance is going to live on the counter, then you want it to look good in your kitchen. When going through options it’s always useful to visualise the item in your kitchen to ensure it will fit in. There are many brands that make sandwich toasters. George Foreman, Breville, Andrew James, Salter, Tower, Russel Hobbs – and many more. We would recommend you buy from a brand you trust as it will make you feel much more comfortable about purchasing a new product. Most of the well-known brands offer warranties on their appliances and many will offer at least a 12-month guarantee. Everyone wants a bargain, but it’s also important to make sure you get value for money. Cheap does not always equate to the best deal. Having said that, most toastie makers are generally similarly priced so it can be difficult to decide which is better, and more expensive does not always mean it’s the right one for you. Once you have decided on what you want from the sandwich toaster you will be able to decide which one will provide you with the most for your money. This article will help you decide which machine is best suited to your family, lifestyle, and budget. Variable temperature with low, medium, and high settings. This chunky yet easily stored sandwich toaster is not the most powerful machine on the market but it does boast a 1000 watt power capacity. 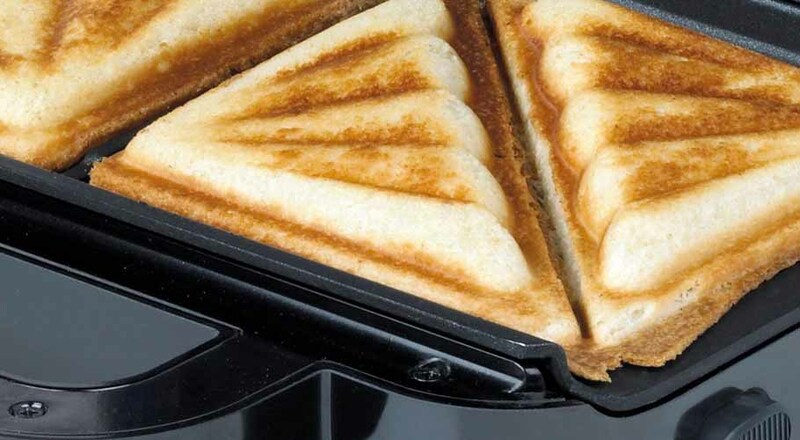 It can also comfortably fit 2-3 toasties at a time, making it ideal for small families. The Breville VST071 also comes with 4 power setting that provides a varied heat control that can be easily adjusted. It’s flat plate design also makes it a great multi-purpose machine that can cook your eggs and bacon just as well as your favourite toasties. Additionally, the Breville has a scratch resistant surface that promotes a long-lived machine. The sturdy metal frame means that it can handle regular usage and has the weight to press but not squish your food. Unlike many others of its kind, it heats up quickly and is operational in just a few minutes. This Breville VST071 is ideal for toasties, panini’s, wraps & crumpets and can also be used to warm naan bread and croissants. The flat heating plates make it easier to clean but also means that you can lose the authentic grill marks on your finished panini. Unfortunately, there is no on/off switch, meaning it begins to heat up as soon as it is plugged in. This appears to be a common feature on many of these appliances, so it is important to remember to switch it off at the plug when you are finished with the product. Additionally, some users have complained that the fixed plates make it harder to clean as they cannot be soaked in water. If you are looking for a durable toasty maker that can feed a small family and is from a reliable brand, then this Breville should defiantly be a contender. It may be chunky but it works quickly and efficiently and most importantly it doesn’t break the bank. In our opinion, it’s the best sandwich toaster for most people. 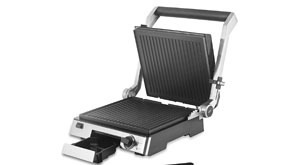 This Tower sandwich toaster and grill will look great in any kitchen due to its minimalistic yet stylish design. Its 2000 W of power combined with thermostatic control make it a very powerful machine but also ensures that your meal does not become charcoal. It is ideal for families as the wide surfaces can accommodate plenty of food, especially when folded out flat for grilling. This versatile appliance provides a healthy alternative to conventional grilling while still allowing you to enjoy a perfectly cooked panini for breakfast. Sandwich toasters are designed to cook the perfect toasty that is crisp on the outside and just right on the inside, and the Tower Family Health Grill does just that! The hinged floating lid prevents your toasties becoming pancakes as it automatically adjusts to the thickness of your food. This also helps to reduce the chance of you losing the contents of your toasty, which is an all too common occurrence with many models of sandwich toasters. The addition of a thermostat allows you to ensure that your food is cooked the way you like it. As the grill is not tilted it can struggle to drain fats in large quantities, so if you are planning on cooking 4 large stakes on this grill be sure to accommodate for this. The Tower T27012 hasn’t got many reviews from regular users but don’t let that put you off – it’s new to the market. At the time of writing, it only has 23 reviews on Amazon.co.uk. But they are all 5 star and our own tests have provided really good results. If you love making panini’s and toasties on a regular basis then this is the perfect appliance for you, it is large enough to cook up to 4 good sized panini’s at a time and can grill your meat and veg in no time. At just under £60 (at the time of writing) it’s not cheap but if you have the budget and know it will be used regularly then we would definitely recommend this as the best sandwich toaster. Who says budget is boring. This sleek and striking design is sophisticated and cheap, as well as moderately powerful with its 1000 Watts. Although this isn’t the most powerful machine of its kind, the fact that there is no temperature gauge means food should be monitored closely. It is ideal for students or young couples as it can easily fit two portions of food on its flat plates. Once plugged in it will begin heating and show a green light when it is operational. True to the name its best at making toasties but can sometimes struggle to deal with grilling steaks. Your toasties will cook quickly and evenly with relatively little mess, and it can comfortably hold 2-3 portions. The hinged swivel lid also ensures that your food isn’t flattened and enables smooth coverage of all the food items. Unfortunately, the flat plate design means that the finished toasties do not have the grilled look that many people desire. Additionally, the non-removable plates can make cleaning more difficult. The fact that there is no temperature control option also means that it is not as effective when used as a grill. This is not an issue with the panini side of things, but it does mean you’ll need to keep an eye on your food to prevent it from burning. 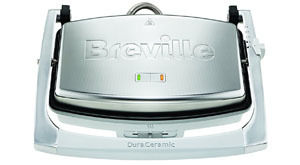 The Breville has been really well received by consumers – especially on Amazon.co.uk. At the time of writing, it scores 4.6 out of 5 stars on Amazon.co.uk from over 1,400 reviews. 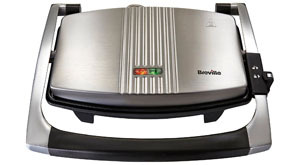 If you want a great toasty maker and an occasional grill the Breville VST025 Sandwich Press, Stainless Steel is for you. It’s ideal for students and it would be a stylish addition to any kitchen. The features are basic and most users prefer it for toasties and paninis rather than grilling their meats. However, it is also great for grilling veggies like mushrooms and tomatoes as they do not produce a lot of grease and do not need too much heat. Sandwich toasters get very greasy very quickly, so it is important to clean it after every use. However, as water and electronics do not mix well, it is advised that a damp cloth be used when the toaster is unplugged but still warm, NOT HOT. If you leave the toaster to completely cool, it is more difficult to clean the grease and food crumbs. Remember to always read the instructions provided with the product as they will advise on the best cleaning method for their specific product. Additionally, it is important not to force the lid down onto your food items as this could result in unnecessary strain on the joints, and could reduce the lifespan of your machine. If your sandwich toaster ever breaks or develops a fault, do not try to fix it yourself. Instead always contact the manufacturer for advice (if it’s still under warranty) and take the machine to a qualified professional.